Day two of baking for Miss A's birthday. Today is the actual day and I've taken the day off of work so we can do something special. Special for me (rather selfishly) meant not waking up at stupid o'clock for work. And yet I was awake at 3:37am. No matter how hard I tried to get back to the lovely dream I was having, it just wasn't going to happen. Isn't that always the way when you're interrupted in the middle of a lovely dream?? Anyway, I decided to capitalise on yet another early start by baking the mini cupcakes for her to take in to nursery tomorrow. I feel like I'm entering into that competitive motherhood thing which I so despise. I don't get why the sisterhood feels the need to compete against each other in that alpha mummy way. I'm a slummy mummy and I try to be proud of it. But she's come home with so many boxes of funsize smarties and tiny slivers of shop bought cake that I feel compelled to provide something. So the Little Iced gems from Mary Berry's 100 Cakes and Bakes seemed to fit the bill. Basically it's cupcakes made in petit fours cases. 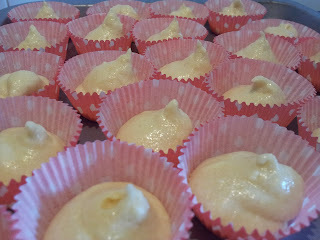 Personally I felt that even for toddlers the petits fours cases to be a bit stingy so I used mini muffin cases from PME. Because the cases were so tiny, I used a disposable piping bag to help me fill them rather than faffing around with teaspoonsful of mixture. I ended up with thirty rather than the sixty five indicated by the recipe. Berry indicates that you should just lay the cases out on a baking sheet with no need to use a special tin. I found that this made the cakes a little misshapen. It may be because I slightly overfilled them. But they look home made and so in my book, that's good. They cook really quickly, the texture is light and spongy (yes I ate cake at 5am but they are tiny!) I much preferred this recipe to her standard-sized vanilla cupcakes which you can find a blog about here. Because they'd risen to the top, I used a thicker icing than normal to decorate. 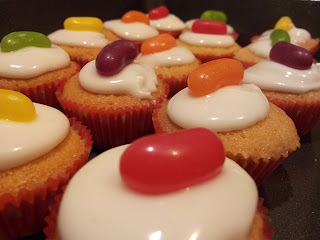 Normally I'd use a runny icing and let it flood to the edge of the case but here it would've dripped right off so I just smooshed a bit on with the back of a teaspoon and topped off with a jelly bean to make them look funky. A great idea for baking for a children's party or as dessert if you're doing a nibbles type party. Preheat the oven to 180c/160c fan/gas4. Arrange the mini cake cases on baking sheets. Beat all the cake ingredients together until thoroughly blended. Spoon scant teaspoonsfuls of mixture into the cases, being careful not to overfill. Bake for 15-20 minutes until well risen and golden brown. Cool on a wire rack. To make the icing, measure the icing sugar into a bowl and add enough lemon juice to give a spreading consistency. Spoon a little on top of each cake and spread out with the back of a teaspoon. When the icing has almost set, top with a sweet. Oh, these are the cutest mini cupcakes!! I love the thickness of the icing and it's so glossy plus those jellybeans gives them such a lovely burst of colour. Also the idea of using a piping bag instead of teaspoons is clever.